The melt of the summer sea ice in the Arctic is dramatic. Each September, when the ice reaches its annual minimum, there used to be around 7.5 million sq km of ice. It is now regularly below 5 million sq km, and hit a record low of 3.6 million sq km in 2012. This downward trend is projected to continue as global temperatures increase, but somewhat erratically. The year at which the Arctic first becomes ‘ice-free’ (traditionally defined as 1 million sq km) is much discussed by scientists and the media, but is often a controversial topic. The IPCC AR5 assessed that the Arctic would likely be ‘reliably ice-free’ (more than 5 consecutive years below 1 million sq km) by mid-21st century, assuming high future emissions, but did not assess the year when it would first be ice free, which would be earlier. Also, we have seen more ice melt than the models projected so an even earlier date is a distinct possibility. Most people expect this year will see a record low in the Arctic’s summer sea-ice cover. However, the SIPN team, who collect sea-ice forecasts from 40 international groups, actually have none who think 2016 will be a record low. Next year or the year after that, I think it will be free of ice in summer and by that I mean the central Arctic will be ice-free. You will be able to cross over the north pole by ship. Professor Wadhams has made similar statements before – so should these forecasts be taken seriously? Firstly, we should all make predictions ahead of time as this tests our physical understanding. Ideally, the methodology used should be clearly documented. The SIPN project described above has done this in a very open way and I have previously described informal efforts for Arctic sea ice forecasts. Professor Wadhams also submitted a forecast to the SIPN team in June 2015 suggesting that the September ice extent would be 0.98 million sq km, but has yet to publish his methodology, as far as I am aware. In the end, there was 4.6 million sq km of sea ice in September 2015, the fourth lowest on record. Such dramatic sea ice forecasts make headlines. They are shared widely around the world. But, our credibility as climate scientists depends on communicating forecasts based on our best physical understanding. These forecasts may or may not change over time as more evidence accumulates. If we make predictions that turn out to be incorrect then that should be acknowledged, the reasons understood and our understanding reevaluated*. There are very serious risks from continued climatic changes and a melting Arctic but we do not serve the public and policy-makers well by exaggerating those risks. Journalists need to be aware of any past history of forecast successes or failures when writing articles. We will soon see an ice-free summer in the Arctic but there is a real danger of ‘crying wolf’ and that does not help anyone. * Whether individual forecasts are ‘right’ or ‘wrong’ needs careful interpretation when considering probabilistic predictions. Great post Ed. I agree with you on exaggeration – it undermines the credibility of science. Not at all helpful when science is informing some potentially huge responses by society. When someone talks up imminent catastrophe, presumably to try to motivate action, they might think they are getting a quick win by getting a scary story out there, but in the long term it will be an own goal. I also find it ironic that on the one hand, the Guardian promotes the “97% consensus” thing, but on the other hand it is quite happy to give huge prominence to an outlier way outside of the mainstream when it happens to suit their narrative. Thanks Rich – agree completely. Barry – I don’t suppose you have a link to Skeptical Science’s “hypocritical” support for Prof. Wadhams’ Arctic predictions do you? I haven’t seen where the print version appeared, but the link in the article above is to the Observer, which has a different set of editors (inc. science editor – who’s article that is). Though they are from the same stable, they have often held opposite editorial views in the past. Also, I generally find the Observer’s science reporting to be as bad as that of Telegraph’s (though often in different ways and subjects). So the contrast between the Guardian pushing the scientific consensus and the Observer going off to the outer limits, is not such a big deal as you make out, really. This is a good point but not one most Americans will understand. The traditions of the two newspapers is not really known in the US. If “consensus” is “mainstream” then should we ignore the “outlier”? It appears that the grief is more about why the “outlier” was given more prominence than then “mainstream”, making it difficult for the “mainstream” to establish the credibility of the climate science. Personally, I agree it is an outlier with a lowest probability. Nevertheless there is this underlying driver – warmest July this year and a few more warmer months before then. When it comes to natural variability – that is, weather patterns in coming weeks/months over Arctic – who knows? Cambridge professor is as good/bad as Met Office scientists in predicting those weather patterns. It nice to think he’s motivated by honourable ideal but of course he could just be ‘motivated’ by poor understanding of the science. 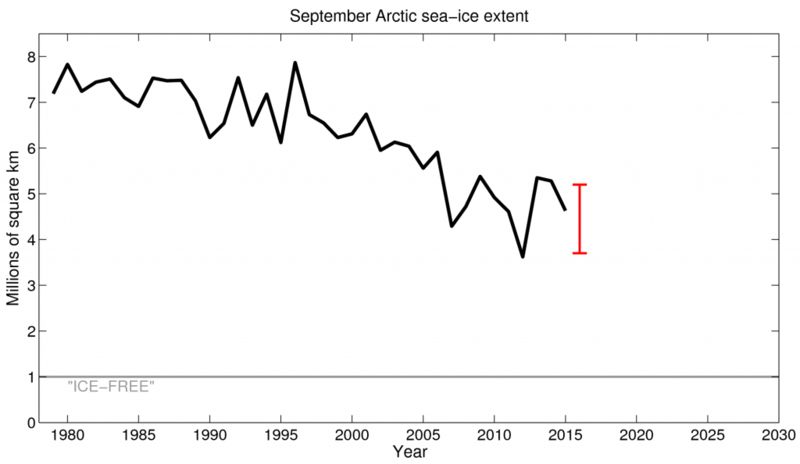 Does it really matter that much if Arctic summer ice does fall below 1 million sq km? It will have no effect on sea levels. For that reason loss of Greenland ice is far more important than any reduction in sea ice. Summer insolation at the poles is higher than that at the equator. Antarctica receives more than the Arctic apparently shows no signs reduction is summer sea ice. That implies to me that warmer water must be reaching the Arctic during summer but not the Antarctic. Agree about Greenland being more important for sea level (but sea ice impact is non-zero) and the importance of ocean heat transport. But, other impacts of a melting Arctic include: albedo feedback, change in air-sea fluxes potentially altering atmospheric circulation patterns, ocean temperature and salinity restructuring with implications for ecosystems etc etc. Ed, I’m curious about your parenthetical comment “sea ice impact is non-zero”. The last reference which I can recall is from a while ago (Shepherd et al., “Recent loss of floating ice and the consequent sea level contribution” (GRL, 2010) which estimated an effect of 0.049+/-0.008 mm/yr. To be sure, this is non-zero, but is not of concern. Is there a more recent study which produced a more significant figure? Hi Harold – yes – that’s the paper I was thinking of. Was being a bit pedantic perhaps, but 0.5cm over a century is small compared to other factors. Extrapolating the rate isn’t terribly useful, because (in this context) the main component responsible for sea level rise currently is Arctic sea ice, and the paper’s Figure 2 makes it clear that this can cause only limited rise in the future. (Using the conversion factor from Table 1 of 6.6 um SLR per 100 km^3 of ice, Figure 2’s inventory of 20,000 km^3 can yield 1.32 mm SLR.) The large potential for SLR is connected to the thickness of Antarctic ice shelves, which (in Shepherd) had been slightly increasing. So your comment had me wondering if there had been an update to the analysis suggesting that the trend was now towards ice thinning. I’ve visited and worked in Arctic Russia as well as northern Alaska, it seems to me (based on personal observation as well as thinking the problem through via a mental model) the warmer open water will increase humidity and this should increase snow fall over both adjoining land areas as well as the surviving sea ice. This could serve as a negative feedback, allowing ice volume to be slightly higher than surface area. I have a built in sensor for air humidity, I feel it in my lungs and skin…and also my eyeballs, which burn a lot when temperature drops below 30 degrees C. This used to make me focus a lot on the humidity forecast. I also noticed the open water in the polynyas seemed to issue a thin fog, which can be hard to see in winter time. I’ve head a lot about albedo changes in open water, but I wonder if there’s a good way to mimic the way the sunlight reflects off water when the sun is low over the horizon and there’s a slight wind? Do the models “understand” that water can look like a mirror? Different climate models may use slightly different equations. As far as I know they all use the solar zenith angle (think: high/low above horizon) and they commonly use at least wind speed – the Cox-Munk wind speed relation is one common example. Here’s a paper from 10 years ago. It is quite likely that the North Pole will be exposed this summer – it’s not happened before. In five years’ time most of the sea-ice could be gone in summer. By 2013, we will see a much smaller area in summertime than now; and certainly by about 2020, I can imagine that only one area will remain in summer. The Arctic will be ice-free in summer within about 20 years, and that much of the decrease will be happening within 10 years. 2015 is a very serious prediction and I think I am pretty much persuaded that that’s when it will happen. A number of scientists who have actually been working with sea ice measurement had predicted some years ago that the retreat would accelerate and that the summer Arctic would become ice-free by 2015 or 2016. I was one of those scientists – and of course bore my share of ridicule for daring to make such an alarmist prediction. This collapse, I predicted would occur in 2015-16 at which time the summer Arctic (August to September) would become ice-free. The final collapse towards that state is now happening and will probably be complete by those dates. The extra open water already created by the retreating ice allows bigger waves to be generated by storms, which are sweeping away the surviving ice. It is truly the case that it will be all gone by 2015. It could even be this year or next year but not later than 2015 there won’t be any ice in the Arctic in the summer. I still think that it is very likely that by mid-September 2015, the ice area will be less than one million square kilometres – the official designation of ice-free, implying only a fringe of floes around the coastlines. That is where the trend is taking us. The evidence suggests that September will be ice-free very soon, and that [will] increase so that within five years or so we could be seeing an ice-free Arctic for up to four months in the summer and much thinner ice for the rest of the year too. Lol. Wadhams is a joke. Still, the press seem to love him. Do you not think that very public predictions by scientists and self proclaimed sea ice “experts” that are laughable, completely undermines completely public trust in science ? Climate science especially so ? There is no point laughing when Michael Grove made his comments about the public’s lack of trust in “experts”, when predictions such as these are made with great publicity in the guardian. These sort of predictions will rightly make people question any and ALL predictions by the climate scientists community, and imho it damages not only climate science, but academia as a whole when clear nonsense such as this is peddled by so called serious papers. and laughing at Gove is unfair.. because he said of those experts the pubic were fed up of… (in the very same interview, seconds later) the organisations and the ones that get things consistently wrong!! Which seems fair enough, nobody has a problem with experts who have a good record of getting things right, more often or not. Again what Gove actually said is on Youtube.. but that ‘don’t trust experts soundbite will get used to misrepresent him for years I suspect. Isn’t Wadhams free to say what he wants in public? And in a free press there’s often at least one journalist who’s happy to report something they like. Real expert opinion is filtered through the peer-reviewed literature and summarised by community groups like the IPCC. What else can scientists do? Thank you for another sensible, informative post. It is heartening to see you, Richard Betts and (in a tweet yesterday) Gavin Schmidt criticising Wadhams’s alarmism and its endless promulgation by Vidal et al. In the past, I have felt there is a double standard when it comes to climate journalism. I have been harshly attacked for articles in the Mail on Sunday written from what I would term a “lukewarmist” perspective, and when I’ve made a mistake – which I have on occasion, and which the paper has always taken steps to correct – the ferocity of these attacks has been redoubled. It has often seemed to me that those who made unsupportable statements from a more alarmist view were given a free pass. I am pleased to note this double standard may no longer be operating. I am pleased to note that you now acknowledge your past mistakes. I hope you won’t consider this a “harsh attack”, but I fear I will have to quibble with your assertion that “the paper has always taken steps to correct” them! David Rose would have a point if he could show that the other newspapers make as many ‘mistakes’ and equally often misrepresent what some people have said when it comes to climate science/scientists. And his point would be even better if the Mail indeed corrected those errors. There’s actually a good example further above from anonymous’ list that the Mail does not correct all errors: a 2014 piece in the Mail has in the title “despite Al Gore’s prediction it would be ICE-FREE by now”, with the article itself accurately quoting him as saying “It could be completely gone in summer in as little as seven years. Seven years from now”. I am sure a journalist like David Rose can see that the title contains a misrepresentation of what Al Gore actually said. “Could” and “would” have clearly different meanings, especially in the context of Gore’s quote. After all, in his Nobel speech Gore ALSO pointed out that one study suggested the arctic could be ice-free in 22 years. Equally bad is that the title suggests that *Gore* predicted this. In reality, Gore clearly cited *scientific studies* that pointed this out as a *possibility*. So, when will this be corrected, David Rose? I remember going to a Campaign Against Climate Change meeting back in 2012. Both Vidal (the Guardian ) author) and Wadham were speaking, predicting ice free by possibly the next year, or in 2-3 years.. Funny moment was when Wadham said the Met Office modelers were in denial about Arctic Ice. The video is on youtube somewhere. Then the Methane Emergency Group tried to hijack the meeting a bit, and it was all quite amusing. Though I did feel sorry for some quite scared members of the audience, one young guy even dashed out saying he couldn’t cope any more! My SPIN model suggests that an ice free Arctic (i.e. the predicted extent being 0 km^2) is unlikely prior to 2033 but probable after 2051. My model is 100% physics free as well, but has demonstrated rather better out-of-sample predictive power than Prof. Wadham’s model. There is nothing wrong with curve fitting, as long as you are clear that is what it is, and don’t ignore statistical assumptions or predictive failure. * The maximum albedo feedback potential probably straddles the summer solstice ( late June ). June Arctic sea ice is declining also, of course, but September, near the equinox, is when albedo effect goes to zero. * GCMs do indicate an even greater percentage loss in the Antarctic than the Arctic. * There have been such temperature shifts in the observed record. * We tend to conceive that Arctic sea ice decline is completely attributable to AGW ( and ignore the increase in Antarctic sea ice ). This may be so, but it is fertile grounds for confirmation bias. There is reason to believe that ice advection has been a significant term. Well, thanks for this paper… it basically says that someone like Prof. P. Wadham, who MUST be capable of making a similar reasoning, is either bulls*itting everybody or trying to get a lucky shot at one year with a particularly low ice cover to become a master of predictions, and get instant recognition on the “green” blogosphere. Either way he is a bad, really bad scientist. Prof. P. Wadham definitely understands the first tenet of prediction: “If you predict, predict often”.